Oh boy! 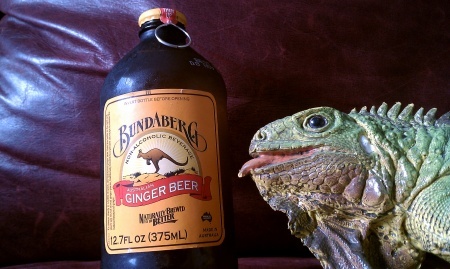 It’s time to remind myself of how much of a wuss I am as I attempt to consume a Bundaberg Australian Ginger Beer. Read as I curl into the fetal position because the main ingredient is “fire”. There is no actual fire in this bottle, but something tells me that if I can’t drink an American ginger beer without discomfort, an Australian one will leave me in tears. If you don’t know our history of reviewing ginger beer, here’s a short lesson. Neither one of us can finish a bottle because our throats cry as much as you do when you watch Steel Magnolias. BURN! Yes, we’re talking about the burn. You know the packaging… cool top, cool kangaroo, and pieces of ginger floating within. Let’s take a whiff. Smells like ginger… I was always a Mary Ann kinda guy myself though. BRING ON THE PAIN!